Like many of you, I had some questions after watching Fantastic Beasts: The Crimes of Grindelwald. So . . . I took to the internet to get some answers. What I found was a whole lot of complaining. For a hot second, I let myself get sucked in until I realized J.K. Rowling can do no wrong, she just can't. Here is why. She created the best story of all time. Hands down HP is literally as good as it can possibly get. I'm a grown woman with kids and a respectable job that truly and deeply believes I am a Hufflepuff. Not in a 'ha ha' kind of way, like truly. Want some concrete evidence? Let's check the data. The movie series is currently ranked number 3 in highest grossing film series. The books (all seven) occupy a spot on the top ten best selling books of all time. Rowling is the richest author in the world. Her Twitter is Gold. If you aren't following her on Twitter, you totally should be. She's not afraid to speak her mind and stand up to the bullies of the world. Whether it is a world issue or her casting choices, J.K. does not back down. Most importantly she stands up for herself. She gives back. It is estimated that Rowling has donated approximately 150 million dollars to various charities as of 2017. That is nearly 25% of her total wealth. She's keeping the HP universe alive. While haters be hating on Fantastics Beasts, be grateful Rowling is taking a timeout from being a millionaire to bang out FIVE movies in order to literally keep the magic alive. I just told you how much she has donated over the years. Rowling has plenty of money. If I had to guess, I'd say one of her greatest motivators for continuing the HP universe is the fans. Yeah, she's probably doing this for you. If Rowling wants to change McGonagall's age or reveal a new unbreakable oath, so what? You get to do that when you write the book on something. So . . . just chill people. Yeah, I totally want more than longing stares between Dumblewald, but we have three more movies! Chill. Trust. Enjoy the Show. In conclusion, J.K. Rowling I admire the human you are and cannot thank you enough for the joy your story has brought my family. 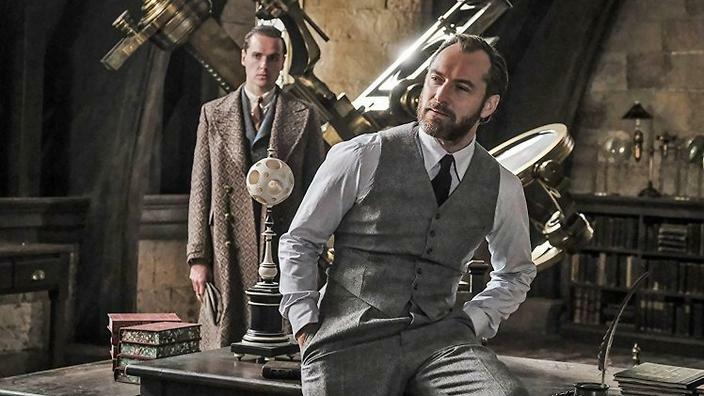 Thank you for bringing Dumbledore back to life and casting Jude Law (just sayin).